How John O’Shea and co are getting on at their clubs. 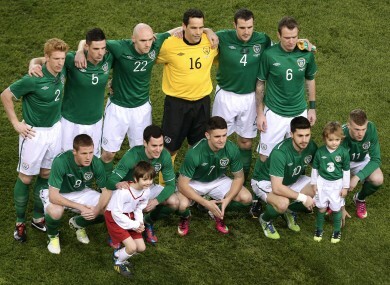 The Ireland team pose for a photo ahead of their recent friendly with Poland. IF YOU ASK the average Irish football supporter their opinion of Paul Green, they are likely to say with the utmost level of conviction that he is “absolutely rubbish,” or something to that effect. Yet of those who confidently make this assertion, the majority will have seldom seen Green play, aside from the rare occasions when he turns out for Ireland. And indeed, the same can be said for many of the Irish players, especially those who ply their trade away from the Premier League, thus avoiding the constant gaze of the media spotlight. So, with that in mind, we’ve decided to put Irish fans’ widely held assumptions to the test, by ascertaining how the players likely to start against Sweden are judged by the supporters who watch them on a weekly basis for their clubs. Though all the below opinions have been taken at random from various fan sites, it’s worth bearing in mind that we’ve tried to pick quotes that epitomise the majority of supporters’ opinions towards these players when representing their clubs. And bear in mind also that there are few sterner critics than a football fan, so brace yourself for some harsh words. Coleman is fourth in the Everton Player of the Season voting (106 votes) on the site, with Fellaini 1st on 186 votes. “I agree on this. Time for some experience at the back, maybe give Keane and Drinkwater a rest and start St Ledger and James.” It’s A Knockeart! Email “‘A pub player’ – Thoughts from the fans who watch Ireland’s footballers every week”. Feedback on “‘A pub player’ – Thoughts from the fans who watch Ireland’s footballers every week”.